When asked about our stories, I’ve noticed that many romantic suspense authors—myself included—focus on the suspense part of the novel when describing them. Understandable, since action, adventure and intrigue does indeed edge us to the front of our seats and sends our pulse racing. However, a heated, flourishing relationship between a woman and a man does even more. Over the course of reading a romance we come to know two people better than we know our closest friends. We know the characters’ strengths and weaknesses. We know their every thought. They become our dear friends. We feel their pain and their love for each other. Their love affair warms our hearts and makes relive a time when we first fell in love with our heroes. We want to believe our own love is as strong and will live through eternity, like theirs. When most young girls of sixteen were getting their first real taste of independence by learning to drive, getting a job, dreaming of college, and of that special someone who’d take them to homecoming and proms, Nicole Carson, my heroine in Seized By Darkness, was surviving. She was kidnapped and forced to become the mistress of mafia lord who plucked her from his human trafficking ring. Seized By Darkness is a powerful, emotional story about a woman finding her strength, gaining her life back and in the process finding love. As you can see, I began by sharing with you part of the suspense plot of Seized By Darkness. I needed to because it is this life changing event which eventually leads Nicole to cross paths with my hero, U.S. Marshal Will Haus. If she had never been kidnapped and had never escaped, she would’ve never have met Will and perhaps they would never know the true meaning of love. Nicole is the perfect woman for Will. Her ordeal has made her strong enough to stand by him, yet in many ways she has strangely been untouched by her nightmare and is both naïve and sweet. Nicole helps Will forget the dreadful world he has to deal with in his profession. And Will is the prefect man for Nicole because he sees the true worth of a person and has a good, caring heart. He also is ferociously loyal and loves just as intensely. Next time someone asks me about Seized By Darkness, I’m going to tell them Seized By Darkness is a beautiful love story about two people who came together because of a horrid incident and they fall deeply and forever in love. Seized By Darkness is on sale at Amazon for $2.99. Grab a copy today and enjoy the first story in this exciting series! Award-winning author Autumn Jordon is published in both romantic suspense and romantic comedy contemporary. Her first release ‘His Witness To Evil’ was a 2009 Golden Heart® finalist and also won the 2010 Golden Leaf for ‘Best First Book’. Seized by Darkness was voted a finalist by Kindle Book Reviewers as a‘Best Indie Romance.’ Taking events from life, twisting them and adding strong heroines and delicious heroes is the recipe she uses for her award-winning novels. 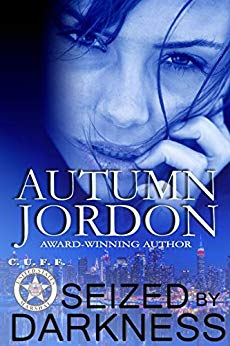 To learn more about Autumn Jordon go to www.autumnjordon.com and join her newsletter, or join her on Facebook or Twitter as @ajordon.